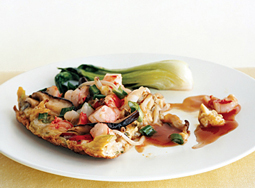 Egg Foo Yung - A recipe from Savor California, the online showcase for extraordinary gourmet foods and beverages from California. Whisk together broth, oyster sauce, ketchup, soy sauce, vinegar, cornstarch, and a pinch of salt in a small heavy saucepan. Bring to a simmer, whisking occasionally, and simmer 2 minutes. Remove sauce from heat. Chop scallions, separating white parts and greens. Beat eggs in a bowl with 1 teaspoon sesame oil and 1/4 tsp each of salt and pepper. Cook white scallion, mushrooms, sprouts, and 1/4 tsp salt in 2 tablespoons sesame oil in a 10-inch nonstick skillet over medium-high heat until any liquid has evaporated, about 5 minutes. Add shrimp and half of scallion greens. Pour in eggs and cook, stirring occasionally, until eggs are just cooked but still slightly loose. Cover skillet and cook until eggs are just set, about 3 minutes. Serve sprinkled with remaining scallion greens. Serve warmed sauce on the side.